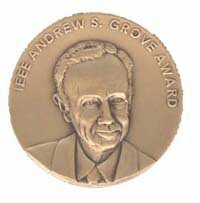 The IEEE Andrew S. Grove Award was established in 1999. It replaced the IEEE Jack A. Morton Award in 2000. This award is named in honor of Andrew Grove's lifetime achievements, including helping to found Intel Corporation. Recipient selection is administered through the Technical Field Awards Council of the IEEE Awards Board.